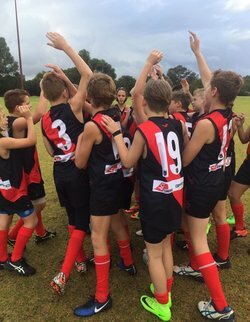 The Demons Year 6 Academy returned in fine form this July School Holidays at Altone Park, Beechboro. The 3-day Camp is aimed at developing young footballers’ skills in an elite environment, allowing for an early insight to the Development Pathway. Over 200 kids from the Perth, Swans and East Perth districts arrived excited and ready to train, under guidance of District Development Staff, WAFL Colts/Senior players and of course a special guest visit from the West Coast Eagles. 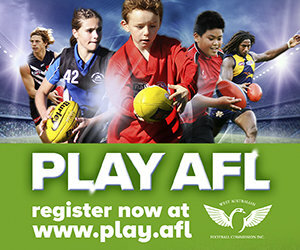 The opening day saw a strong focus on skill development with fun and multiple touches of the footy being the major key. The kids were also introduced to dynamic stretching techniques and team chemistry building games. The Perth team were lucky enough to be joined by West Coast Eagles players Nathan Vardy, Jack Darling & Mark Hutchings. Nathan already had a good connection with the group, with a couple of our players coached by his uncle Stu at Kenwick JFC. The Eagles boys introduced the team to a range of small sided games straight from the playbook of head coach Adam Simpson. Small Sided Games utilize game based training techniques, replicating game situations while teaching skill development. Ranging from handball, to kicking and clean hands work the Demons players showed class, precision and quality throughout the day before getting the chance to hang out and take Q&A, signatures and the odd selfie with all WCE players in attendance. The group returned hungry to compete again on day 2. The focus turned to the AFL Draft Combine testing, with the team experiencing the key tests that players would encounter at the official combine. The Nathan Buckley Kicking test led the proceedings, with the team executing very solid scores with a high level of kicking skill across the morning. The Brad Johnson Goal Kicking test was next on the agenda, the competition heated up as the kids went head to head to test their goal kicking ability. The day finished up with a focus on match simulation small sided games and final preparation for the round robin games the following morning. Game day arrived in tough conditions, with the wettest day of the week commencing just after the opening bounce. The Demons team showed great composure and skill through the trying conditions having a solid win over Swans. The team stayed true to the key learning points over the camp and played an exciting, quality attacking brand of footy across both games. The conditions wearing away at all teams, a narrow loss to East Perth in game 2 saw a 1-1 split across the competition. Football Development Officer Chris Brown said "It was a fantastic 3 days from a very talented and fun group of kids. The quality of the footy, the attitude from all involved and the improvement shown over the duration of the Academy was exceptional. The kids really embraced the introduction to new training techniques and small sided game skill development. I’m already excited to see what they can do, and how far they can progress when we return for the Year 7 Academy next April. I would also like to thank CDO Tayla Tenaglia and Perth FC’s Matt Thompson for assisting across the entire program". Offers for the 2017 Demons Year 7 Academy will go out to all current Year 6 Academy members in early 2018. Any remaining spots will be open to all interested Year 7 Demons District Participants. Stay tuned to the Demons District Social Accounts for more information.